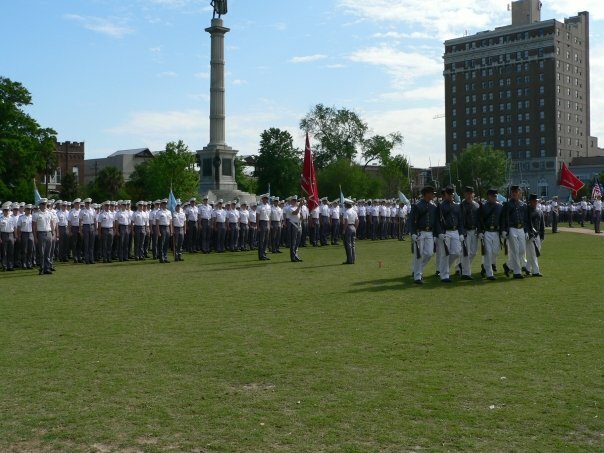 The Citadel is combining two big events for cadets the weekend of March 17 – 19, Corps Day and Recognition Day. The school website mentions three events which includes the Leadership Symposium. Since most families who come to town do so to see the Summerall Guards ceremony on Saturday morning, and this year for Recognition Day, I’ll focus on those two events. The schedules are available online for the weekend. For a more detailed schedule for activities parents will want to attend, go to the parents page of the school website and read through the Corps and Recognition Day 2017 page. The crowd begins to form on the parade field about 30 minutes before the scheduled ceremony. The schedule lists the time as 8:45 – 9:45am. So arriving by 8:15am to find your preferred spot along the roped off area is a good idea. After the rifle exchange I was able to get this photo of Cadet Daniel Smith and Cadet Jason Wells. The rifle Jason is holding was once carried by my son. Daniel’s father is also in the photo. Another must is insect repellant for the morning. The entire ceremony only lasts about 20 minutes or so but after it is over you’ll want to snap photos with your cadet. It is a bit of a scramble after it ends. Ask your cadet the best way to find them after the ceremony ends. Many of them will be talking with the Summerall Guard whose rifle they now carry and receiving their Summerall Guard patch. Most years they’ve had a luncheon for the Summerall Guards after the parade. It is at the luncheon where we purchased out Summerall Guards parent t-shirt. It is a fundraiser for them to help with expenses. Check with your cadet for the plans for this year. Members of the Class of 2019 begin their march to Marion Square on Recognition Day for the Class of 2019. The schedule this year is completely different from previous years since Recognition Day has been moved from April to the same weekend as Corps Day. Stories from parents of upperclass cadets of what they did on Recognition Day won’t really apply to your experience this year. This weekend is not like Parents Weekend where the emphasis is on spending time together. The Recognition Day part of the weekend is really about the Class of 2020 and their time together, parents while welcome to watch are not the focus. If you are planning to be in town, remember you may not see your cadet Friday afternoon and evening. They have meetings and will need to get their rooms in inspection order for the open barracks Saturday morning. If they do have time off to see you for dinner consider it a bonus visit. Saturday will be jam-packed with activities. Wear comfortable clothes and shoes for the day. Look over the schedule to see just how busy you’ll be and make your plans for lunch based on your family. The barracks open at 8:00am. Check with your son or daughter to see if they want any food brought to them. 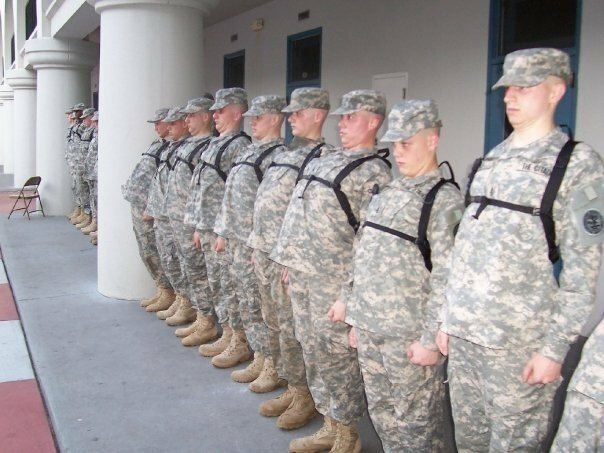 They will have a VERY strenuous workout after the parade so they may not want anything too heavy. The Rifle Legion and the Summerall Guards will perform on the parade field that morning. Check with your cadet to see if they will be attending both or either of those events. My son’s senior mentor was a Summerall Guard so he wanted to see that ceremony. After the Summerall Guards exchange rifles the Corps of Cadets must prepare for the 10:00 parade. This would be a good time to have a light snack. The Canteen will be open but to avoid lines you may want to pack your own snacks or lunch. You’ll also have time after the parade and before the Gauntlet begins to grab something to eat or sit in the reception room in Mark Clark Hall between events. Members of the Class of 2019 participate in the gauntlet as upperclass cadets guide the activities. The Gauntlet begins at 11:30. It is a series of physical challenges the 4th Class cadets go through together by company. They will be either on the parade field or the WLI field. Some years the school posts a map. I haven’t seen it posted yet. To get an idea of how Recognition Day was handled in the past I’ve found the PowerPoint from 2015 on the website. 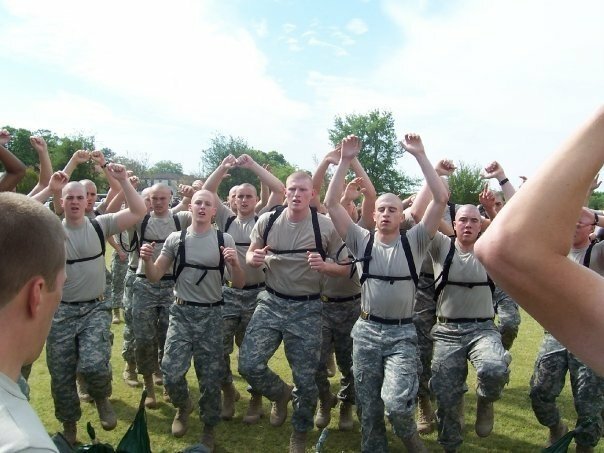 The past several years after the gauntlet is over and the 4th class cadets are in the barracks and hear the announcement “The 4th Class System is no longer in effect.” The newly recognized cadets would come out to give a hug to their family members. The timing is very tight this year and the cadets may not have time to come out. The training schedule has the cookout in the barracks beginning at 1320 and the hygiene time to get ready for the retaking of the oath on the parade ground at 3:00. The March is on the schedule for 1500. If you haven’t ordered a meal through the school (the ordering time frame has past), pack a lunch or eat in the Canteen the school. General Rosa and Provost Dr. Connie Book visit with class of 2019 family members at a lunch held last year after the gauntlet. This year boxed lunches will be available to purchase. Cadets who saved an overnight and followed the protocol can take one Saturday night. Most of the cadets are too exhausted to want to do much Saturday night. If you want to go out for a nice meal Sunday is the better day to do that. I’ll be helping my youngest daughter at her high school musical that weekend so I’ll have to miss the excitement. I look forward to seeing everyone’s photos. Next year I’ll have my own college freshman, just not a knob at The Citadel. Each day we get just that much closer to the day all knobs live for, Recognition Day. It is the day that first year cadets hear the announcement, “The fourth class system is no longer in effect.” You can find the date of Recognition day on the Yearly Planning Calendar posted to the Office of the Commandant page. You can also put Recognition Day in the search window of the main page to find information. The current year’s activities usually aren’t posted until about a month ahead. I read the book, “In the Company of Men,” by Nancy Mace second semester of my cadets knob year. It really helped me understand the process my son was going through. You can find the book through Amazon. Over the years the activities and schedule has changed but the significance has not. In the last 4 years more family members arrive in Charleston to watch the events of Saturday from a distance. The morning starts very early with physical training (PT) and is followed by a series of challenges. The morning ends in the barracks where the knobs run through a last set of push ups. There is a lunch served in each battalion. We watched through the sallyport gates. You can find several videos of the last few minutes when the announcement is made. Put The Citadel Recognition Day in the YouTube search window to find more videos.The Commandants page posted a PowerPoint in 2011 of the days events. You’ll get tired just reading about the day. Remember, if you do attend Recognition Day it is not a time for you to visit with your cadet. You will mostly watch from a distance. Some families do get to congratulate their cadet after their lunch. Some see them after their Recognition Day dinner. Sunday morning brunch is a time you can most likely get to spend some time. In our case our son and his friend decided they would rather come back to the hotel Saturday night with us than go out with their buddies. Most families I’ve heard from say their cadet goes out with their friends to celebrate. Like everything else at The Citadel Ask your cadet what they want to do. Last year I wrote about the two times in the life of a cadet that they express sheer joy. Recognition Day is the first. Ring Weekend is the second. I posted photos in two different albums on Facebook. Here is the first and this is the second. 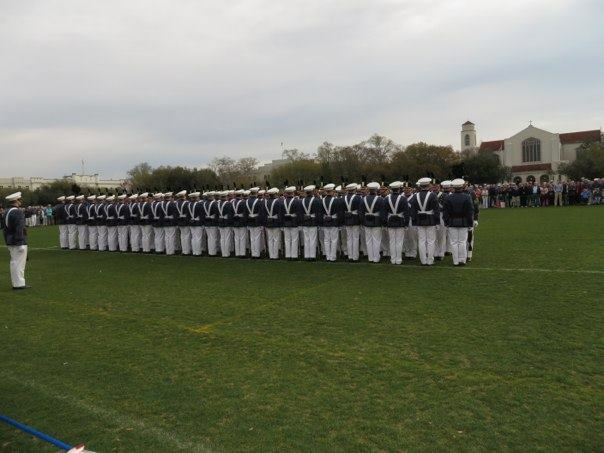 A letter to families posted by the Citadel Foundation from the President of the Class of 2012 is here. He describes the day.